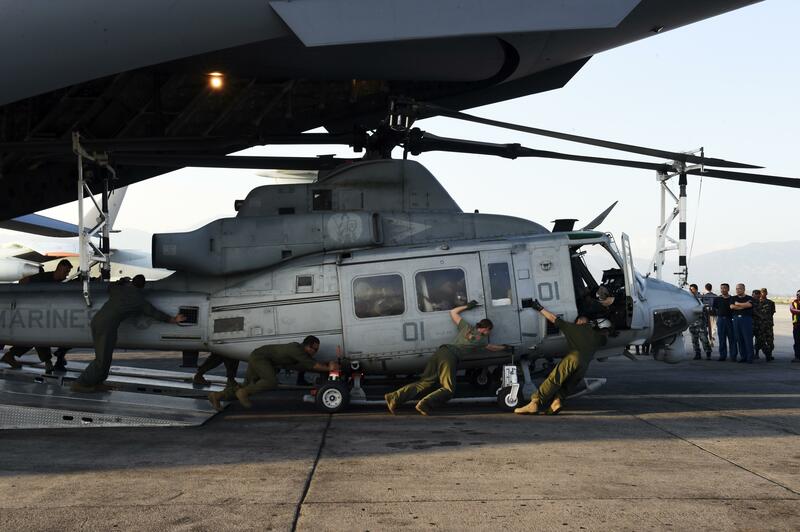 U.S. Marine helicopter disappears during Nepal earthquake relief. The crew of a U.S. military transport plane unload a Huey helicopter at Kathmandu’s international airport on May 3, 2015. More than two days after a U.S. military helicopter disappeared while assisting in the Nepal earthquake relief effort, search and rescue teams have been unable to locate the chopper. The UH-1Y Huey helicopter was carrying six Marines and two Nepalese soldiers to deliver aid to the district of Dolakha, east of Kathmandu when it was declared missing on Tuesday. The [missing helicopter] was last seen after another helicopter in the area “picked up some [radio] chatter about a fuel problem,” [Army Col. Steve Warren, a Defense Department spokesman] said Tuesday shortly after the aircraft was reported missing. “Right now we are hopeful that there was no crash. There has been no [emergency] beacon, no other signs — no flames, no smoke, no hole in the ground — to indicate that there was a crash,” Warren said Tuesday… the six Marines, along with two Nepalese army soldiers on board, had dropped off some relief supplies, including tarps and rice, at one location and then took off en route to a second drop spot when contact was lost, Warren said. “If it set down, then it can’t get radio transmissions out because that means it’s on low ground surrounded by mountains. Essentially what we have right now is truly a missing helicopter. We simply don’t know its location,” Warren said. The mountainous Himalayan terrain has made the search particularly difficult both on the ground and from the air.